The professional divorce attorneys here at the Peskind Law Firm have over 35 years of cumulative representing people in complex divorce matters. Our firm helps our clients divide their assets such as property and businesses, help resolve child custody cases and addresses issues of child maintenance and support. Though no divorce is easy for those involved, we look to help our clients achieve the perfect divorce, in which both parties ultimately get what is fair in regards to the divorce process. 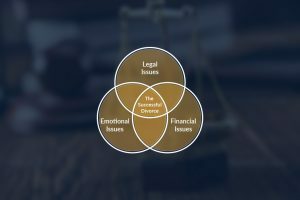 We are redefining how family and divorce law is approached by offering more than just legal counsel and this helps to accomplish the successful divorce. If you have any questions about our family and divorce law services or if you are in need of a divorce attorney in Naperville, call us today at 630-444-0701. Or simply fill out the contact form to the right and one of our helpful associates will respond shortly. Over the years we have learned that legal expertise is not always enough when it comes to divorce cases. There are other issues surrounding your divorce that need extra attention and can help make the divorce process much smoother. At the Peskind Law Firm, we encompass those often forgotten, yet equally important aspects during these difficult times. Our firm consists of professionals with expertise in additional professions that pertain to your divorce but are often overlooked. We have a Certified Divorce Coach to help you navigate through your divorce process by setting achievable and realistic goals during your case and for after your divorce. Our on staff CPA is here to assist you with the financial aspect of your divorce. For more information on our divorce law services or if you are in need of a professional divorce attorney in Naperville, call us today at 630-444-0701. You can also fill out the contact form on the right and one of our knowledgeable representatives will respond shortly.